May be useful to explain to young children that all fathers are different and each one is good at different things. Introduces the concept of work and careers, and encourages fathers and sons to be proud of one another. Snip the little crocodile has no idea what his dad does all day. 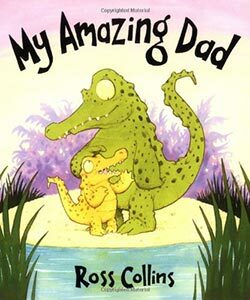 All the other animals tell him about all the amazing things their dads can do: Max the monkey’s dad whooshes from tree to tree, Stripe the zebra has a father who is the best at hiding, and Bongo the gorilla is so proud of the way his dad can beat his chest really loudly. Snip trudges home, thinking that everyone else has a cooler dad than him. His mum takes him to the high reeds and they peer through into a clearing together. Snip sees his dad teaching the young animals. His mum explains that it is his dad who teaches everyone how to hide, run fast, and do all the special things they’ll do when they grow up. Snip proudly hugs his dad and they set off fishing together. The book ends with Snip telling his dad that he wants to be just like him when he grows up.